Fulton Republican Committee Chairman Mark Aldasch implores councilors to table the budget in consideration of the '800-pound gorilla' in the room. FULTON, NY – After a sometimes contentious but overwhelmingly positive public hearing where taxpayers covered nearly every line of the mayor’s 2015 proposed budget, councilors unanimously passed the $15.7 million spending plan. Despite the mixed bag of praise and criticism, each speaker during the hour and twenty minute exchange between speakers and city’s elected officials lauded the mayor and councilors for holding the line on taxes but noted there is more work to be done. 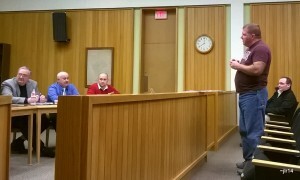 Fulton’s Bob Weston addressed the council Tuesday. Fulton resident and former city councilor Bob Weston was first to speak and as a way to provide some perspective, compared the county’s two cities, Oswego and Fulton. He noted that the city of Oswego has three times the manpower. “We have 108. I think we’re doing as much as we can with the least amount of people. I think that’s a credit to everybody who’s working on it,” the former councilor said. 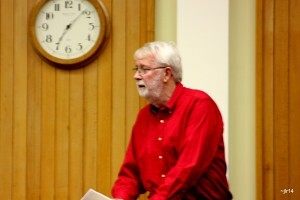 During previous public sessions of regular council meetings, Planning Board Commission member, and Fulton resident Dennis Merlino expressed concern about the city’s Parks and Recreation budget, and asked councilors and the mayor during their budgeting process to keep those lines of spending intact, for the good of the community. 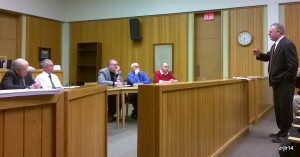 Fulton lawyer Salvatore Lanza talks with Bob Weston and Frank Castiglia prior to Tuesday’s budget hearing. Oswego County Legislator Frank Castiglia said this is a good budget. “When ever you have a zero percent tax increase it’s a good budget,” he said. However, Castiglia noted that there were some areas where the mayor could have trimmed expenses – sometimes by only a hundred dollars or so, and in the case of the city issued cell phones, by thousands. The legislator added that with city employee’s making the money they make, they can afford their own cell phones. The other recommendation Castiglia made was the closure of the west side fire station. “Mr. Mayor what is the cost we have to maintain the west side fire station?” Castiglia asked. Dennis Merlino, Planning Board Commission member, speaks to the council regarding the budget while Acting Fire Chief Paul Foster studies the document. Mayor Ron Woodward responded that the regular heating, maintenance and cleaning costs amounted to approximately $8,000 to $10,000 per year. With that, Castiglia asked that the council consider closing the station, saving taxpayers that money, and then sell the building to a private entity to get it back on the tax rolls. There was a brief discussion about the fire department’s newest engine – Engine 1 – housed at the west side. Castiglia said the rumor is that it’s there because it’s the only building the engine fits inside. “Is that fact or fiction?” Castiglia asked. 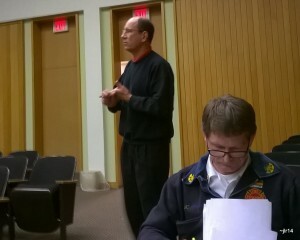 Acting Fire Chief Paul Foster was on hand, and responded the legislator’s concern. “That’s fiction,” he said. The mayor explained that when the fire engine was ordered it was specified at a height that could be accommodated by the city’s fire houses. When the engine arrived it did not fit at the east side but ultimately the company who built the engine paid to have a bigger door installed at the east side fire station. 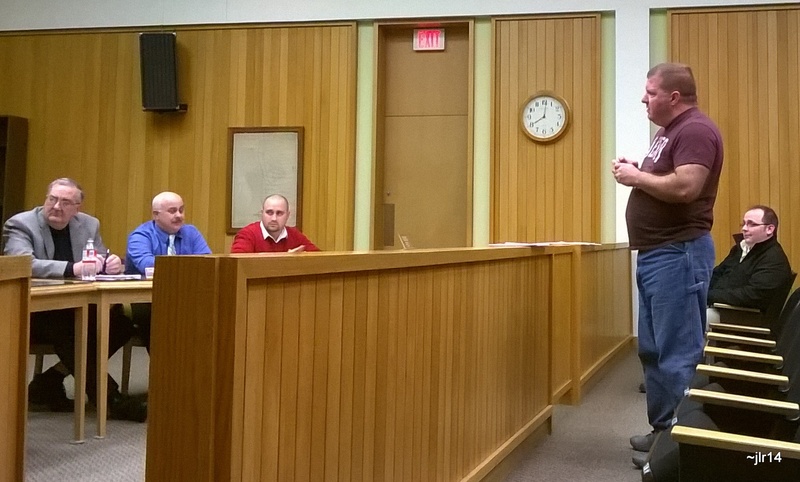 Mayor Ron Woodward, and City Clerk Dan O’Brien, and Councilors Tom Kenyon, Dan Knopp and Eric Raponi hear local businessman Sal Lanza’s views on the proposed 2015 budget. In response to Castiglia’s continued pressure to revamp the city’s fire department, Councilor Dan Knopp asked the county representative to appeal to his cohorts in the county legislature to formulate a county-wide fire district. “We need that for the whole county, not just the city,” Knopp said. “That’s up to the majority caucus up there,” Castiglia responded. Next to speak was local attorney Sal Lanza, who has owned his business in Fulton for almost 20 years. He noted his parents also ran a bakery business in Fulton for more than 25 years. “I’ve looked at the budget and I must commend all of you for the work that you’ve done. Obviously you’ve worked very hard on the budget,” Lanza said. But as the city’s businesses have dwindled over the years, so has its revenue and resources – and the associated downsizing and cuts came with an equal amount of public frustration and “turmoil over the cuts and where the money was going to go,” Lanza said. Lanza asked the mayor and councilors to consider putting two police cars on the east side and two cars on the west side, with minimal administrative staffing – an investigator and deputy investigator during the day at the municipal building. Lanza added that he did not want to see anyone lose their job, and making the personnel cuts in his own office from five to two was hurtful, but it was necessary for the continued survival of his business – and the city should make the same kind of hard choices. With respect to the fire department, Lanza said he is not in favor of closing the west side fire station, noting the city’s two west-side schools, numerous businesses, and the potential need to assist Granby in mutual aid. The local businessman also raised the concern that due to tax exemptions and agreements, only half of the property in the city of Fulton is taxed. Fulton Republican Committee Chairman Mark Aldasch implores councilors to table the budget in consideration of the ‘800-pound gorilla’ in the room. Mark Aldasch, Fulton Republican Committee chairman at first thanked councilors for holding the line on taxes, but added that the city remains number one in New York State in overall taxes. “That’s school district and county, but we’re number one,” he said. According to SeeThroughNY, in 2012 at $51.23 per $1,000 of assessed value the city of Fulton ranked the 4th city in the state, behind Gloversville – $52.40, Binghamton – $51.97 and Little Falls – $51.59. By comparison of all municipalities – city, town and village – the village of Phoenix – the next highest taxed municipality in the county at $47.55 ranked 77th; Oneida – Aldasch’s proclaimed ‘sister city’, at $33.59, ranked 1109th; and the city of Oswego, at $37.41, ranked 537th. “I can’t get out of here. I’m stuck. I don’t want to stay here, I want to leave. It’s dying but nobody is doing anything about it and by nobody I mean you guys,” Aldasch said. Through the course of sometimes heated discussion, Aldasch recommended councilors table the budget vote and appeal to the city of Oneida for their city contracts with police and fire unions as a guide to slashing the public safety budget lines. Oswego County Today asked Aldasch after the meeting if a dissolution of the city police force with county sheriff’s taking over would result in a higher county tax rate for police services. He said no, he did not believe there would be an increase for the city of Fulton taxpayers county tax burden, and in the maneuver Fulton taxpayers stood to gain the benefit of a $3 million budget cut. Councilors did not table the budget, but they did agreed to look at the city of Oneida’s methods and contracts. The discussion inflamed again when Aldasch continued to press his request for councilors to table the budget, visit Oneida and slash the public safety lines before passing the budget. 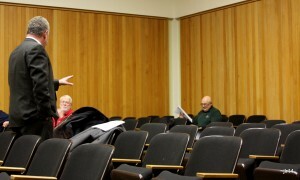 “Mark, do you think we just started this budget?” Councilor Tom Kenyon asked. Knopp and Woodward reminded Aldasch that the union contract and arbitration process was where all of the public safety negotiation would have to take place, and those contracts would not be settled before the end of 2014. Knopp noted that in the interest of good faith negotiation, the city was beholden to include a budget line to support the current contract. With discussion reaching a stalling point, the mayor asked for further comment, and hearing none, thanked those present for their participation in the public hearing. The passed budget includes $15.7 million in spending, with a $6,464,816 real property tax levy – which is $28,185 less than the tax levy for 2014. Despite the saving, due in part, to a decrease in the overall city’s assessed value, the property tax rate per $1,000 of assessed value will remain the same $19.662 as it was in 2014. Fulton is the canary in the coal mine, they’re a little farther on the edge than many other upstate cities ready to go over the cliff. Unfortunately I think the decision of the Governor and state to ban Fracking sealed the death sentence of many of the upstate cities. These problems started with the loss of manufacturing and other jobs many years ago and the failure of city leaders to recognize what was coming, I personally blame politicians like the Mayor that have been around much to long and didn’t start trimming and cutting expenses years ago and negotiated union contracts and pension not sustainable. Comparing us to Oswego who just raised their taxes 75%, is a cop out they also have a population of new college students that Fulton doesn’t have for additional economic revenues purposes. Aldasch is on the right track, new leadership and drastic cutting (not just a cell phone bill) is needed or let the bankruptcy begin with the city of Fulton leading the way. It’s too bad Fulton was once a beautiful city by the river built by our grandparents and parent’s blood sweat, tears and fiscal responsiblity. Please stop looking to the Towns to bail you out. If you can’t afford a paid Fire Dept. go with a volunteer department. Fulton has a history of grabbing what it’s neighbors have. I guess it was karma when the Kmart plaza became tax exempt.